I'm a huge fan of coconut oil and I've written a few articles discussing the beauty and health benefits here on the blog. I personally love it and added it to my daily beauty and health routine years ago once I found out how amazing it is. So when Skinny & Co. Coconut oil asked me to review their raw coconut oil I couldn't wait to try it. You may have not heard of Skinny & Co. yet, but their growing, and fast! Skinny Coconut oil is an all-natural, pesticide-free, and 100% pure, made in small batches to ensure the highest quality standards. They also promote fair trade with their suppliers and use ethical business practices within their community. Due to the high quality coconut oil, Skinny & Co. provides the ultimate health and beauty benefits because it's in the rawest form and the highest quality on the market. Unlike most coconut oils available on the market, Skinny Coconut oil is never heated above room temperature and goes through a slow manufacturing process to ensure their quality remains the best on the market. This process Skinny Coconut oil takes about three times longer as other processes used and requires about double the coconuts needed to fill their 16.9 oz jars. 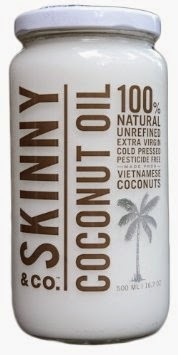 Skinny Coconut oil comes from mature pesticide-free coconuts from the jungles of Vietnam. They are one of the only coconut oil companies who harvest their coconuts from a wild untouched environment instead of a plantation. In an area known as Ben Tre, the palm trees and coconuts grown here have been awarded the “Tree of Life” award by the Asia-Pacific Coconut Community recognizing the pristine environment and superior quality of Ben Tre coconuts. Their coconuts are processed in the same jungle within 5 hours of being picked, which makes our coconut oil extra virgin. Now what other coconut oil company can say that? Unlike most coconut oils that have a rough texture, cracks within the jar, bleached white color, and an overpowering smell, Skinny Coconut oil has a light fragrance, a smooth texture, and a creamy white color just like the meat within the mature coconuts they use. Their coconut oil has a very neutral taste so I could eat it right out of the spoon. What I do to get my daily coconut oil is put it in the refrigerator and then spoon it out. I'm not a huge fan of the coconut oil taste so I prefer it cold. Click here to get more ideas on how to incorporate coconut oil in your daily routine. Coconut oil makes the BEST hair serum. For hair, you only need the smallest amount. It will seal the cuticle and add amazing shine instantly. Coconut oil is potent so you only need the smallest amount. It will seal the cuticle and add amazing elasticity and shine instantly. You can also use as a pre-conditioning treatment and shampoo out. So get your Skinny Coconut oil today and reap the benefits of glowing skin, hair, weight loss and amazing health! You can learn more and order via their website at: www.skinnyandcompany.com, and Amazon.com. You can also connect with them on Twitter and Facebook.